Welcome to the Shark portable steam cleaner reviews and ratings. We look at the portable shark steam cleaner and review the portable steam pocket mop and the Shark Light and Easy mop. The term portable means many things. The main definition states that portability is the ability of an item to be easily transported or moved around. Previously we reviewed the Shark hand held steam cleaner, so in this article we will review two of their more famous creations. In essence, all steam cleaners are portable because if they were not portable then … you couldn’t clean very well. The beauty of this Shark Portable Steam Cleaner is that it is lightweight, can easily be carried around with you as you clean and as a handy multi purpose steamer can not only tackle cleaning jobs but can also be used to steam clothing and clean windows. It is ideal to use in hard to reach nooks and crannies and to remove build up dirt from appliances. Customers reported that it does really well cleaning pots and frying pans. I find that the best way to use it is to have a scrub brush (the kind you use in your kitchen to clean pots) in one hand while directing steam from the steamer in the other hand when you want to steam clean. It has a 10-ounce water tank, a handy indicator light to let you know when the water is steam ready and steam continuously or can provide variable steam. It takes about 5 minutes to heat up, will steam for about 15 minutes and has a 16,5 ft power cord. The attachments includes the following: a water measuring cup and funnel, a microfiber towel, a clothing steam cloth, cleaning cloth, a selection of brushes, pads and scrubbing pads and a squeegee for window cleaning. It is a great little steamer for small tasks around the house and is really good at getting to dirt in hard to reach places. This Shark Portable Steam Cleaner is a unique product that was designed to be used with an arrangement of tools and specialized fabric attachments. There are different “pockets” that can be attached to the steamer. One of these is the all purpose cylinder pocket. This allows you to clean around areas for example a staircase banister. Another pocket that you can attach is the All purpose wedge. It is the largest and provides the ability to clean flat surfaces. 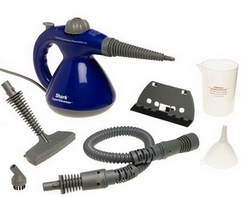 The other attachments include: a concentrator nozzle, wedge cleaning wand, wedge cleaning pocket (all purpose), cylinder cleaning pocket (all purpose), cylinder dust cleaning pocket, nylon brushes and various garment steamer attachments. Consumers have mixed reviews on this product. Some say it worked well and was perfect for cleaning window blinds. It works well on small spaces and comes with a good assortment of attachments. The negative comments indicate that it is very easy to burn yourself with this steamer. When inverting the cleaner the steam comes down which can burn you. You can of course get it through Shark’s official website where you can pay through 3 payments. You also get to return it if you decided that its not for you, however you will have to pay for return shipping. This mop is a fun, pump activated, steam mop which delivers steam on demand – or with a pump. The handle is ergonomically designed to reduce strain on your back and it can swivel. This allows you access to hard to reach areas and helps clean those areas that really need to be cleaned! With each steam mop you get a microfiber pad which allow you to trap dirt and grime within their fibers. With each mop you also get a carpet glider which allows you to not just clean your hard floors but also refresh those carpets. This product is great for everyday cleaning and easily handles everyday spills and messes. The features include a .24 liter water tank capacity, 1,550 watts of power, 20’ cord, 11.5” cleaning path, 1 year warranty and it is quite light at a mere 4 lbs. Consumers like that this steam mop does exactly what it’s supposed to – be your household helper. Its easy to use, light weight and can get the job done. This mop can: clean stairs, bathrooms, wood floors, cleans tough stains, the pumping action is very easy and not tiring at all. All of the reviewers loved the back saver option which allows the mop to get under furniture without you having to continuously bend. Some reviewers wished that the tank was a bit larger, however it was sized to provide greater ease in portability as a larger tank would create an increase in weight. This machine can be yours for a very affordable price if you buy through Amazon. Euro Pro steam cleaner reviews: Shark or Euro Pro?